"Pendean Farmhouse" from Midhurst, Sussex. View looking East. 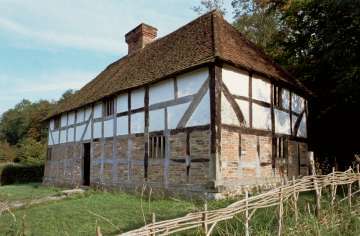 A timber-framed house dating from the late 16th century. 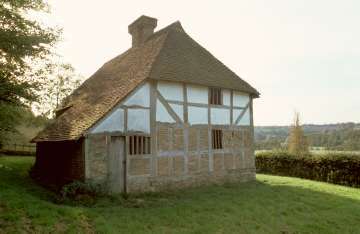 This house demonstrates an evolutionary step on from "Bayleaf" by lacking the central hall feature and the inclusion of a brick, three flue, chimney allowing the heating of two ground floor rooms and one upper floor chamber. The central hall became a less common feature of such buildings from about the middle of the 16th century. However this building retains some features from that earlier period such as unglazed windows and upper chambers being open to the rafters. "Pendean Farmhouse" from Midhurst, Sussex. View looking West.